Strawberry plants are classified as forbs due to their lack of woody tissue that supports other plants like trees and allows those other plants to reach towering heights. 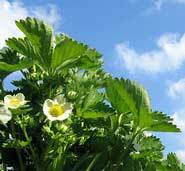 Consequently, the growth of strawberry plants vertically is limited. Additionally, there are many different varieties of strawberries. The non-hybrid species typically have smaller growth habits and are most often around 8 inches or 20 centimeters tall at their growth zenith, although they can and do reach 12 inches (~30 cm) in optimal conditions. These are the Fragaria vesca, Fragaria virginiana, Fragaria chiloensis, and other native-type, non-hybrid varieties. The larger strawberry varieties are hybrids, Fragaria x ananassa. These hybrid varieties are developed through an extensive process of testing and trials and manifest genetic traits that are expressed in bigger plants with more and better quality strawberries. These hybrid plants are primarily what is available for home gardeners who wish to buy strawberry plants to grow at home. These hybrids usually reach about 10-12 inches (~25-30 cm), but will often rise to heights of even 14-16 inches (~35-40 cm). Other factors also affect the final peak height of strawberry plants. The vegetative growth of strawberry plants is greatly influenced by the nutrients available to the growing plants. If a nitrogen deficiency is present in the soil or growing medium, the plants will be stunted and shorter. And, on the flip side, too much nitrogen will induce greater vegetative growth and taller plants, albeit at the expense of actual strawberry production. So, how tall do strawberries grow? It all depends! If your plants are hybrids, 10-14 inches (~25-35 cm) should be considered healthy unless evidence of disease or deficiency is present. I have a large plant that I believe is a strawberry as that’s what I planted. However it has tons of buds that have no petals left but doesn’t seem to be producing any fruit. How can I determine if it’s a strawberry or not? My strawberry plant is tall and seems to let little light in for the berries to ripen. Should I cut back some of the leaves to let light to the berries underneath? I have heard there is a strawberry that grows straight up and the fruits don’t touch the soil. If there is such a plant what is it called? A lot of strawberries will grow vertically, but the weight of the berries is what bends the fruit spars down. The varieties, especially native species, that produce very small strawberries will often keep the berries off the ground. Fragaria vesca and Fragaria virginiana will both likely produce berries small enough that the spars keep them suspended off the ground. Good luck! My friend and I are living in an apartment next year and want to grow strawberries. What are the best kind for a small area, and which kind of strawberry plant will produce the most berries? The June-bearing varieties will typically produce the overall greatest yield. However, if you are going to be growing indoors, I’d probably recommend choosing a day-neutral or everbearing variety. Learn more here! Good luck! My strawberries each had a hole burrowed into their sides last year. Mr. Strawberry, do you have any idea what could be causing this? Probably a worm or fly larvae. 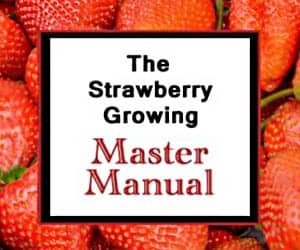 You may be able to figure out exactly what is doing it by using the resources in the Strawberry Library. Good luck! I would like to grow strawberries in a hydrponic drip, nft, or flood and drain system. How best would this be accomplished? I’m thinking two plants in a pvc pipe system set on a table to catch the runners. Just set the system up as you would for other plants. Placing the system on a table or other easily-accessible surface does allow for catching and replanting the runner plants easily. Good luck! Can I grow strawberries in a box. How can I determine how big the fuit is going to be? Yes, you can grow strawberries just about anywhere. The only way to determine fruit size is to provide the plant with everything it needs and see how big they get! Good luck! My school has a garden and we do not have room for big plants. Would a strawberry plant be a good or bad choice.Also lots of people don’t watch where they are going near the garden. Would a strawberry plant be able to grow? Strawberry plants are relatively small, so they could grow in a small garden. However, not very many plants stand up well to being trampled. So, that might make it a wee bit difficult. Good luck! That is a very strange strawberry plant, indeed. My plants are getting close to 4′ tall! Yes, FEET! They are huge! Is that just too much nitrogen? How do I fix this!? I’ve never seen or heard of a 4 foot strawberry plant. Can you send a picture? what is the length of a strawberry plant’s length wise growth? Most varieties will span 12-14 inches, not counting their runners. They can get as big as 16-20 inches, however, under optimal and controlled conditions.